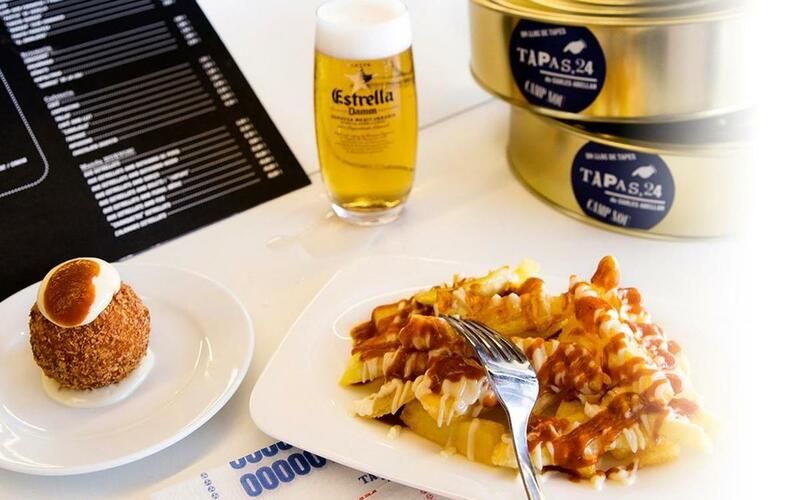 FC Barcelona and Carles Abellan have joined forces to present Tapas, 24 Camp Nou, a top quality tapas restaurant with dishes that carry the seal of the prestigious Michelin starred chef. The bar is open from 9 .00am until 11.00pm every day of the week, and will open even later on match days at the Camp Nou. With 140 m2 of floor space and two large terraces it also has parking facilities on the club grounds and members get 5% discount on the bill. This is Abellan’s third bar in the city and the attractions include the chance to watch matches live on two giant screens and fussball tables to while away the time. But the most important element of all are the tapas, as well as a set lunchtime menu for just 15 euros. The fare includes ‘brava’ potatoes, ‘bomba’ meatballs in breadcrumbs, Russian salad, Iberian ham croquettes, roast chicken, Spanish omelette, a very special ham and cheese ‘Bikini’ sandwich, the ‘Alhucenas’ lamb brochette, the McFoie Burger, ‘Maldonado’ ham, octopus ‘a feira’, cod fritters, ‘capipota’, Korean chicken wings and lemon-fried mushrooms. Then there are the olives stuffed with anchovies, chips with ‘wasabi’ sauce, anchovies from l’Escala, cockles in sauce, mussels in light vinegar, sardines in olive oil, tuna streaks, clams, egg with different varieties of sausage, from ‘botifarra’ to ‘chorizo’, and all kinds of other Catalan, Spanish and international delicacies, along with local beers and wines to help wash it all down.